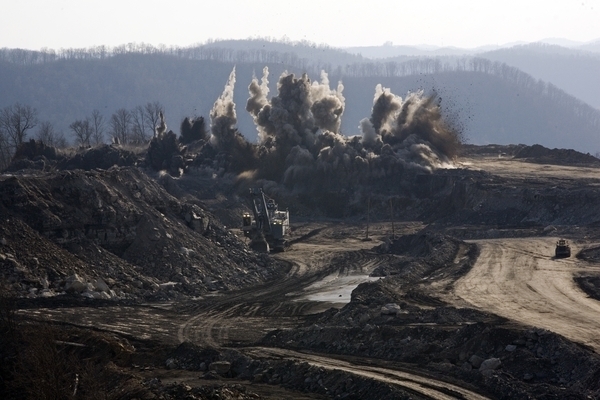 The impacts of mountaintop removal with valley fills are immense and irreversible. Yesterday’s U.S. Senate subcommittee hearing on mountaintop removal produced some major disclosures, and also the public release of two new independent reports that detail the growing scientific evidence about this practice’s environmental impacts. EPAâ€™s 2002 Landscape-Scale Cumulative Impact Study modeled terrestrial impacts based on past surface mine permit data. These data provide a retrospective examination of the impacts to forest that occurred over the 11-year period from 1992 to 2002. The Study estimates that 595 square miles (380,547 acres) of the forest environment (vegetation and soils) in the study area will be cleared due surface coal mining during this 11-year period. This represents 3.4 percent of the forest area that existed in 1992. Based on a 2003 analysis, the impacts to forest and forest soils have subsequently been projected over the next 10 years. For the entire 22-year period from 1992 to 2013, the estimated forest clearing in the study area would be 1,189 square miles (761,000 acres) or 6.8 percent of the forest that existed in 1992. Should these forest not be restored, invaluable water quality and ecological services will be lost. Forest losses of this magnitude, although largely temporary, are not inconsequential. In addition to the popularly appreciated wildlife, recreational, and timber resources associate with forests systems, many ecological services can be attributed to forest systems. We are just beginning to understand and assign value to these ecological services. Yesterday’s hearing also featured testimony from University of Maryland ecologist Margaret A. Palmer. And submitted to the committee were two key reports: Mountaintop Mining Valley Fills and Aquatic Ecosystems: A Scientific White Paper on Impacts and Mitigation Approaches, by Palmer and Emily Bernhardt of Duke University, and Aquatic Hazard of Selenium Pollution From Mountaintop Removal Coal Mining by Dennis Lemly of Wake Forest University. The reports were not posted by Senate staffers on the committee Web site, but I’m making them available via Coal Tattoo. By way of full disclosure, all three authors have worked for environmental groups who oppose mountaintop removal, and it’s my understanding that these reports were commissioned by the Appalachian Center for the Economy and the Environment and the Sierra Club. But all three are respected scientists, and their work here draws on accepted and peer-reviewed science. These are major reports worth taking a look at. The topography and the hydrology of mountain top mined watersheds are radically altered â€“ valley contours are flattened and precipitation is routed through rock lined ditches on the surface or percolates through fill material. Even after reclamation, the vegetation is dramatically different. The alteration in topography persists forever and it will take centuries to reestablish the soils and forests that were historically present. The impacts of mountain top mining are more severe than other land use changes within these watersheds (e.g. clear cutting, residential development) because they are immense in scale and lead to irreversible alterations of watersheds. In fact, a 1999 study singles out mountaintop mining and valley fills in West Virginia and adjacent states as the greatest contributor to earth moving activity in the United States. Some watersheds have more than 25 percentÂ of their area covered by surface mine permits. This represents not only a significant loss of a treasured natural resource, but loss of ecosystems that are critical to the provision of water that is clean and abundant in supply to the larger downstream streams and rivers. — Streams impacted by valley fills often have 30-40 fold increases in sulfate concentrations and sulfate concentrations in receiving waters continue to increase after mining activities end. Higher sulfate concentrations can lead to impacts on aquatic organisms and ecosystem functions. — Ions of calcium, magnesium, and biocarbonate increase dramatically in the waters so that electrical conductivity levels and total suspendedÂ solids in receiving streams below fills can be extremely high. Trace elements of iron, aluminum, zinc and selenium are often elevated as well. — The cumulative effect of elevated levels of all these ions is highly correlated to biological impairment in streams below valley fills. Functionally important aquatic biota are sensitive to ionic stress which disrupts water balance and can cause stress or death. Ephemeral, intermittent or perennial streams that are buried beneath valley fills represent a significant natural resource loss. As headwater streams they represent the points â€œwhere rivers are bornâ€ because their flow and associated biota, sediment, and dissolved constituents feed all downstream waters.Â Any major changes affecting headwater tributaries or any activity that isolates or cuts off these tributaries from the lower part of the watershed will have profound consequences for hydrologic processes, sediment delivery, channel morphology, biogeochemistry, and stream ecology further downstream in the watershed which is why their loss due to mountain top mining is of such concern. Digging a ditch, adding rocks and diverting water to it does not make a living, functioning stream. Data from other watersheds that are undergoing mountaintop removal mining paint a grim picture for aquatic life. Monitoring reports reveal that selenium releases are widespread and alarmingly high. resources. The weight of evidence is substantial and indisputable. EPAâ€™s in-house evaluation, independent academic research, and private sector investigations all support the same conclusion: selenium pollution from mountaintop removal coal mining poses an imminent threat to aquatic life in central Appalachia. Judge Haden told us so- almost 10 years ago. The forest of course does much more than feed his family. It puts dinner on the table of the fisherman, the hunter, the ginseng collector, the mushroom picker and countless others who have made a living of the forest. It also provides clean drinking water for our largest cities, absorbs atmospheric carbon at no cost, and shelters our wildlife. Do we really want to trade all of this for a few short term jobs? Randy Huffman should be ashamed of himself for putting so many people out of work and for destroying so much of West Virginia’s forest just to appease the coal industry. That’s not his job,. His job is to protect West Virginians and they should demand his removal. Dave, did you know that some water companies get their water from the Big Coal River as well? Whitesville does. My sister lives in an area close to St. Albans and their drinking water comes from the Big Coal River at the end of it’s journey through the coalfields. I told her NOT to drink that water nor give it to her small children. When she gets water out of their spigot and she lets the water sit in the glass for a few hours there is a milky thready looking substance that forms in the water. They buy bottled water. It is sad when people who are even on public water supplies don’t feel comfortable injesting the water from their spigots. That gets to be expensive when there are several people in the family. Clear water that runs all the time does not equal clean water. Toxic metals like Selenium, Arsenic, Mercury, et.al. can be in the clearest water. And changing a stream from an ephemeral or intermittent that discharges clean water with low ionic concentrations (conductivities below 50) into a perennial one that continuously discharges water with conductivities over 1000 is not a good trade-off. Selenium is not just some new scare tatic, it is just one of the many toxins that is a result of MTR. While it is a necessary nutrient in very small does (e.g., vitamins), but it can become toxic very quick. If people are becoming alarmed by the reports about Selenium, it is because they should be. While MTR may not go away for a long time, it should be known by all what the consequences of it are and mining industry should be held more accountable to properly reduce and mitigate the damages caused by their actions. The National Mine Land Reclamation Center at WVU (http://wvwri.nrcce.wvu.edu/programs/nmlrc/) has lots of experience with methods for improving the chemistry of the water coming from post-mining mine sites. They have information on costs, technologies, etc. No doubt they will be involved, at least as consultants, in dealing with the issue of elevated selenium from MTR sites. I could be wrong, but I don’t think the “rubble” that’s left after the coal is taken from a MTR and that goes into valley fills is much different from mine spoil from earlier countour mines, so there should be some longer-term data. I get the impression that the sheer volume of the spoil from a MTR mine is significant, also the prevalence of the spoil areas is some watersheds. To see some really ghastly stream death from mine drainage that will last for hundreds of years, and is way too costly to treat, come on up to Monongalia or Preston County and see some bright orange streams where nothing lives. Long-time activist Cindy Rank probably has the figures at her fingertips for the number of gallons per day of highly acidic, toxic-mineral-laden drainage that flows into West Virginia streams and rivers from mining in sulfur-containing sandstones. I know that it’s many millions of gallons per day and has poisoned hundreds of miles of streams. Coal companies and taxpayers are spending millions (Cindy will know that amount, too) to treat some drainage to reduce the degree of pollution — it’s a long-term environmental nightmare. The takeaway message for folks talking about drainage and MTR: toxic mine drainage is not a temporary issue. Once it gets going bad, it’s here to stay. This was an injected mixture just before a international match — it has nothing to do with Selenium in water. Also: the coal mining now occurring in the Appalachian mountains is similiar to the area mining that was done in western Kentucky and throughout the midwestern states from the late 1950s through the 1980s — by Gaint Earth Movers (GEM), electic-powered shovels and draglines — though impacts are much greater in the mountains. A lot that is being said by all sides are empty words meant only to fuel emotional conflict instead of meaningful results — that needs to stop. Note: I’m a retired USGS scientist who was with OSMRE (1978-1995) after being an Ohio reclamation specialist (1975-1978). I don’t fault miners for being fearful about the future if MTR was banned (not likely anytime soon) or heavily restricted. It is instinctual to want to protect one’s livelihood (and thus their family). I don’t like him, but I would not compare Don Blankenship to a cult leader; he just knows how to press the right buttons (e.g., fear) and spin information to his advantage. It is easy to say that one wouldn’t do something that hurt others to make a living, but actually not doing it is another thing. Every day people by items that are made under conditions that cause harm to others either directly or indirectly (e.g, clothing from sweatshops or child labor, etc.) because those items are made more cheaply or we prize them. As Americans, we hardly ever concern ourselves with where our stuff comes from as long as it is relatively “safe”. West Virginians may laugh at a person from New York City who has no real concept of where and how the steak on their table got there, but is it really different with electricity? It would go a long way with miners if the government (and it pains me to say this) would spend some money on developing industry in the coal fields that could actually compete with coal for the available workforce. The best thing that we can do as individuals (beyond power conservation), is get informed , stay informed, and stay involved (vote, write letters, talk to others, etc.). And above all keep things civil. No one is going to be swayed by name calling or hostility, but a little empathy can go a long way.